Automotive diagnostic scan tools are a combination of software and electronic devices used in many automobile workshops, by professionals, service station which forms an integral component to diagnose faults and repair them. Demand for automotive diagnostic scan tools is increasing day by day as per customers demand for sophisticated automated diagnostics scan tools. Automotive diagnostic scan tools had replaced the manual diagnostic tools. Major purpose of automotive diagnostic scan tools is for detecting and analyzing the malfunctions of electronic systems in vehicles. Modern diagnostic tools are immensely efficient in diagnosing and analyzing the complex problems while performing diagnostics in the vehicle’s powertrain, chassis and body. Demand for these tools is also increasing as they take less time to diagnose the faults. These tools are widely used in every type of vehicle whether it’s a passenger car, heavy commercial vehicle or low commercial vehicle. It is expected that the market for automotive diagnostic scan tools will grow rapidly during the forecasting period at a CAGR of around 6.10%. Growth of automotive diagnostics scan tools is directly related to the growth and production of automobiles globally. It is expected that the global automotive diagnostics scan tool market will reach to USD 56.77 Billion by the end of the forecasting period. Increase in disposable income of customers will trigger the growth of automobile market which will directly lead to the growth of automotive diagnostic scan tools market globally. The global automotive diagnostics scan tools market is studied for the Asia Pacific (China, Japan, India and rest of Asia Pacific), North America (the U.S., Mexico, and Canada), Europe (the U.K, Germany) and Rest of the World. Increasing production and usage of vehicles are some of the major factors for the growth of the global automotive diagnostic scan tools market. Consumer demand for sophisticated automotive diagnostics scan tools helps in the growth of automotive diagnostics scan tools market globally. 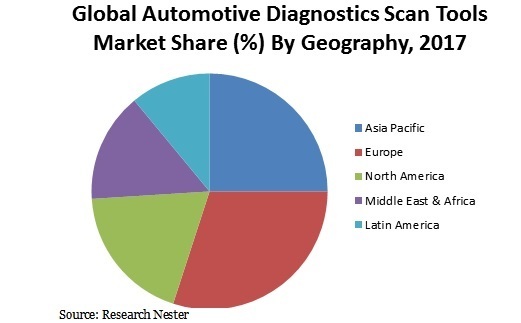 Growing presence of automotive OEM’s in developing regions also stimulating the automotive diagnostics scan tools market. In current scenario, modern cars are coming with advanced analytical electronic components and computers which not only help mechanic but also the vehicle user to easily diagnose the problem and setting it. Factors such as increasing production of vehicles, their growing usage and rise in demand for advanced automotive diagnostics equipment boost the market growth. Major challenges which the automotive diagnostics scan tool market is facing is with the functioning of diagnostic scan tools and its high price which is not affordable by many consumers around the world.